usiness, education, work: communication skills along with a good presentation are the key to giving a successful future to your ideas. Presenting them is just as important as the ideas themselves. It requires not only personal qualities, but also proper equipment that gives you the freedom to share. Visualize your ideas with the pocket smartphone Samsung Galaxy Beam. Yes, I know I said a smartphone, but no, there is no mistake. Simply this Samsung smartphone holds a built-in projector. The appearance resembles very much the one of Galaxy S2. The case periphery features a distinctive bright yellow line which is a wonderful addition to the black color of the case. The display is TFT capacitive touchscreen and has a 4’’ diagonal. Its resolution is 480×800 pixels which stands for 233 ppi. 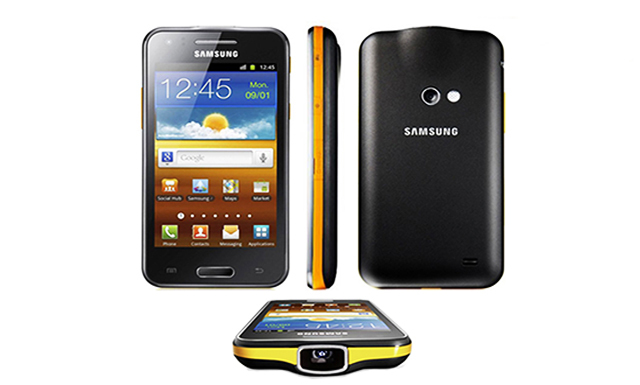 Samsung Galaxy Beam works with Android 2.3 Gingerbread and comes loaded with a dual-core processor Cortex A9 at the working frequency of 1GHz. It provides a smooth playback and projection performance with no lags. The graphics are brought to you by Mali-400. Samsung Galaxy Beam provides 8GB of internal storage and 768MB of RAM. The good news is that there is a micro SD card slot that expands the storage with up to 32GB to increase the number of contents you can share. Now let’s talk about the projector specifications. The 15 Lumen digital light projector delivers nHD resolution, or in numbers it stands for 640×360. The picture projects on the wall at 50-inch diagonal. Share your vision with this ultra slim projector smartphone. Share your videos, photos and all kinds of contents with everyone, all you need is a flat surface. The built-in projector provides stunningly good definition with a graded throw up to 2 meters away. Actually you have the flexibility to adjust sizing according to your needs. Share the best moments from your vacation with your whole family or just chose a video on YouTube or from your archives. Now sit back and enjoy. Samsung Galaxy Beam converts your wall into a cinema screen. An interesting and very helpful feature of the projector is the Ambience Mode which helps you create magical environments. Thanks to the over head projector support you can easily customize, decorate and create the desired atmosphere using light. This flexible business and education companion will not betray you no matter how long you share. The 2000 mAh long-lasting high-capacity battery provides power for nearly 10 hours working on 3G. The 5MP camera with autofocus helps you capture the moment perfectly so that you easily share every detail. In low light the camera work is facilitated by an LED flash so nothing will remain hidden. It also captures video in HD resolution @30fps. It is accompanied by a second front-facing 1.3MP camera. The chassis featured one USB2.0 and another microUSB port. There is also a 3.5mm ear jack.